It only took a month for Kendra Horn to turn into a double-speaking, D.C. politician. 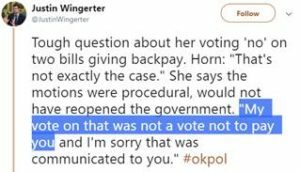 This isn’t the first time Horn has misled constituents. In 2018, she was pressed on her possible support for Pelosi. Her response? 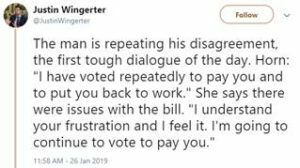 “I think one of the messages that this election cycle and one of the things that I’ve always believed is that we need right now new direction and new leadership.” Less than a month later she voted to make Pelosi speaker…. Kendra Horn may have fooled voters once, but she won’t get away with fooling them twice.